Our boat is a Bristol 41.1 designed by Ted Hood in 1981. She was owned by one couple for her entire life and known to them as Maxi. We have heeded the advice of many sailors before us who have said that it is now more acceptable to change the name of sailboats unlike in the days of past. Finding the right boat for us was arduous enough, we cannot imagine her name being another criteria for selection! The name was decided long before we ever found our boat; I think in our dreamy planning stages. Leander is the Greek mythological character who swam across the Hellespont (modern day Dardanelles, in Turkey) every night to meet his lover Hero. He also gave his name to one of Sima’s favorite structures in Istanbul, Leander’s Tower. Leander is an even more meaningful name to Paul: His great great great grandfather Alexander Robertson was a Gunner in Nelson’s Navy. 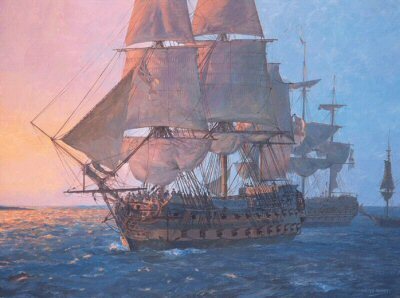 The first ship that he sailed on was, HMS Leander. Paul: The story of Alexander Robertson is so interesting. Your mother (Irene) got me started studying her side of the family. We are related and she sent me a lot of information of your line as it relates to me. By the way my mother was named Irene F. Robertson and we lived in Lynn, Ma in the lakeside area on Verona St. I am now 78 years old and live in Indiana. A lot of trivia but I wanted to share with you as you share with me on your traveles around the world. God Bless and safe sailing.